It’s snakebite season and the Georgia Poison Center (GPC) is warning people to watch their step and pay close attention while enjoying outdoor activities. As temperatures increase snakes become more active. Of the 46 species of snakes known in Georgia, only six species are venomous: Copperhead, Cottonmouth, Eastern Diamondback Rattlesnake, Timber/Canebrake Rattlesnake, Pigmy Rattlesnake and Eastern Coral Snake. Snakes are usually not aggressive and will only bite when provoked. These bites occur when the snake is frightened and is forced to react in self-defense. While the majority of poisonous snake bites are not fatal, they can cause major complications. If you are bitten by a snake we urge you to call us immediately as there are a number of dos and don’ts in regards to treatment. It is estimated that 7,000 – 8,000 people per year are bitten by venomous snakes. The GPC receives hundreds of phone calls concerning snakebites every year. Throughout the years we have seen a considerable increase in snakebites with 2016 being our highest with 466 snakebite calls. 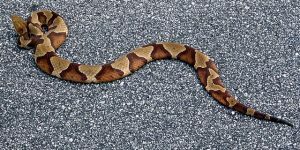 Out of those 466 nearly 20% were treated with antidote, most for Copperhead bites. The Atlanta Journal Constitution – How can you protect your pet from snakebite in Georgia?